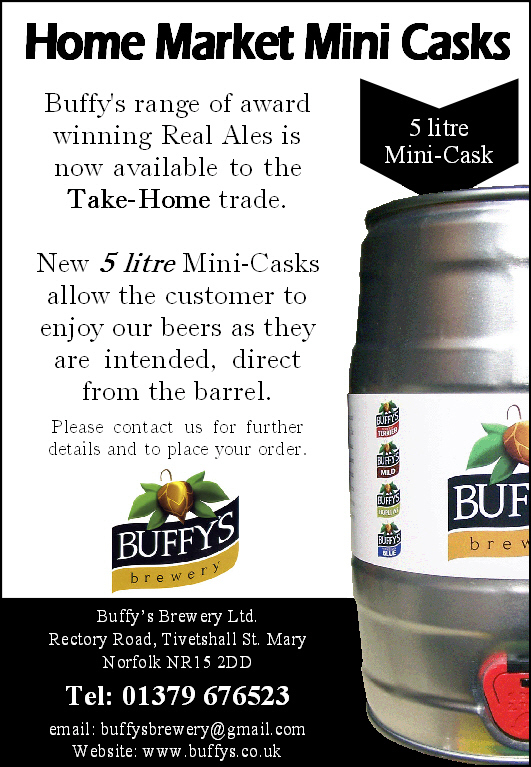 Superb quality real ales from Buffys Brewery are always on offer with a rotating choice from the eight beers in their portfolio. The cellar is maintained by the brewer himself so you can be assured of the highest standards possible with every pint. On the rare occasion a pint may not suit this is exchanged immediately with no quibbles! We always try to have a mild on pump which is a rarity these days. We participate in a discount scheme for CAMRA members. Produce your card and get 30p off any pint of Buffys! The Cherry Tree also offers the lovely Aspalls Cyder on draught which is made by those southerners across the border in Suffolk. San Miguel is the premium lager on tap along with the usual Guinness and cooking lager. The wine offering is excellent for a pub of this size � supplied by Mallards Fine Wines of Mileham we offer a choice of three reds and three whites plus a gorgeous pink. By the glass or bottle they are fantastic quality and far too drinkable. A full range of branded spirits is offered along with bottled brands from the chiller. Bar food is available and evening meals can be provided with prior booking. We do not have dartboard, nor a pool table and certainly no television. Our customers make much merry, and lively conversation provides good entertainment. But we do host the best pub quiz around for miles � the first Wednesday of every month starting at 8pm. And we also boast one of the most enjoyable jam sessions going � every other Tuesday evening from 8pm. Bring along you guitar/mouth organ/ whistle and join in. All styles played with a heavy emphasis on the blues! The Cherry Tree is extremely active within the community and over the year raises considerable sums for charity. We do this via fundraising at The Big Quiz, monthly coffee mornings and special promotions. We host the occasional music evening and are hoping to introduce a regular country & western night. Do come along as we are sure that you will find something to enjoy even if it just a quiet pint! Oh, and you really must not forget POKER every Sunday evening. Cash game (�5 pp) starting at 8pm, playing for fun but someone IS going to walk off with that cash pot!